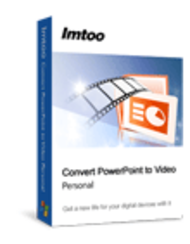 ImTOO Convert PowerPoint to Video Personal provides a simple tool for quickly converting slideshows into video files including AVI, MOV, WMV, MP4, H.264, HD AVI, HD H.264, and HD MPEG-2 TS. With this PPT to video converter, you can watch your slideshows not only on PC but also on iPhone, iPod, PSP and BlackBerry. Apart from converting PPT to video, the software enables you to record you narration and add background music. It's useful tool to build your business. 1. Convert PowerPoint (PPT) presentations to AVI, WMV, MOV, MP4, H.264 2. Convert slideshows to H.264, HD AVI, HD H.264, and HD MPEG-2 TS. 3. Record your presentation rehearsal. 4. Add an audio file with the specified time interval between slides. 5. Adjust output parameters including video size, video quality, frame rate and file name. 6. Check for updates automatically. 7. Automatically shut down, exit, standby or hibernate after conversion is done. 8. Multiple skins and multilingual interfaces. 9. Support all presentations including ppt, pptx, pptm, ppsx, pps, ppsm, potx, potm, pot. 10. Compatible with Microsoft PowerPoint XP, 2003, 2007.